Macworld.com is a great way to stay on top of the latest news, reviews, and tips about Apple, its products, and the third-party ecosystem that supports it all—but it isn’t the only way. If you’re hopelessly addicted to Twitter or Facebook, a news socialite, or you just want the full story anywhere, anytime, on any device, here are some great ways to stay in-the-know with Macworld. Macworld, its staff, and other contributors fit quite well into 140 characters, so there are lots of ways to follow just what you want. 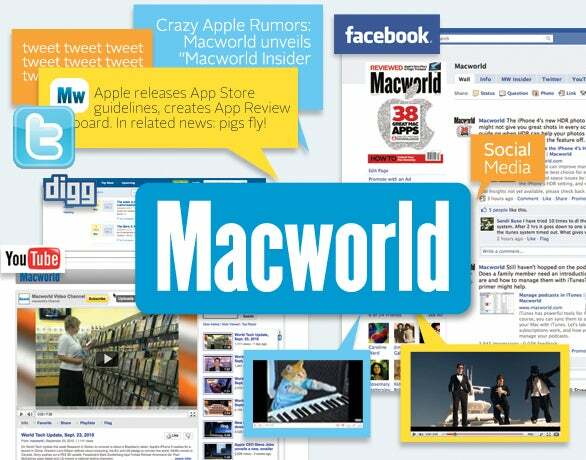 Twitter / Macworld, for example, is a curated account of the most important news, while @AllMacworld is the firehouse of every single news headline, review, tip, and anything else we publish. Other Macworld accounts can be found under our Macworld on Twitter list, which include @MacworldBiz, @MacOSXHintsRSS, and @MacGems. If you’re looking for Macworld’s human element, a couple of other Twitter Lists that we put together under the @Macworld account should have you covered. Our Staff List collects the personal accounts of Macworld’s staff, while our Contributors List collects our freelance writers and bloggers. The Tech People List collects the accounts of other Apple-related tweeters. If you hang out around the Facebook water cooler, you can find a few Macworld pages there as well. The Macworld Facebook Page contains curated, important news like our @Macworld account, though we post a little less frequently, include fun links that we might not cover at Macworld.com, and interact more with readers. The Macworld Page also contains tabs for our Twitter accounts, YouTube channel, a discussion area for Facebook users, and photos of product first-looks and other Apple interestingness. Finally, we also post interesting App Store apps and roundups to our App Guide Page, and only the best-of-the-best rated Mac apps to our App Gems Page. Digg is a great place to find out about the latest news from all over the Web, and the Macworld Digg channel lets you follow our news there as well. Everything published on Macworld.com feeds into Digg, so you can vote up and comment on them to help bring awareness to your favorite articles, breaking news, and reviews. Yep, I mentioned earlier that we have a Macworld YouTube channel. There we occasionally post video of Apple events, product reviews, fun first looks, and a weekly World Tech Update. If you want to follow news about only the iPad, video hardware, the Business Center, photography, or any of over 50 specific topics, there’s a feed for that. And with Macworld Insider (see below), you can read the full text of a post on your iPhone while taking the train to work, in your browser’s newsreader while stuck on Windows at work, or on your iPad while relaxing on the front porch, all without ever having to click through to the Macworld.com site. We introduced Macworld Insider in early September, and so far the response has been excellent. In addition to access to our full array of full text RSS feeds and other features like disabling ads on the site, access to unencrypted PDF archives, and chatting with editors, there's also a private Insider forum where our editors can give you extra-special attention. That’s about it for now—we keep pretty busy across Twitter, Facebook, Digg, and YouTube. Follow, subscribe, and Digg us for the best Apple news, tips, and reviews!